American media circles were all abuzz this weekend about a little episode on Twitter featuring Donald Trump and a quote he liked. Note the name on the Gawker account is ilduce2016. Il Duce, for those who don’t know is Italian for The Leader, and was Mussolini’s chosen title. German nazis took the cue from Mussolini, incidentally, when they referred to Adolf Hitler as der fuhrer. David Thompson is an independent economist in the same way that Jerry Earle and Wayne Lucas are independent human resource consultants. But the problem isn’t that CBC couldn’t make a factual statement in the first three words of a news story. Nor is it a problem that Thompson recently visited the province at the expense of a public sector union and met with the Premier to offer some helpful “independent” advice. The problem is that Thompson simply didn’t know anything about the province and the state of the government’s finances. What exactly is Sheilagh O’Leary? Did she get elected to Council in the Ward 4 by-election or is she a re-elected councillor? Well, never mind. She will fit right in with the gang at Tammany on Gower, d.b.a. St. John’s city hall. They are, generally speaking, very high on themselves, and very low when it comes to competence. Last fall, Conservatives, New Democrats, and assorted political watchers attacked the Liberals for the lack of detail in their election platform. Now, most of those same people are accusing the Liberals of hoodwinking folks into voting for them with all their great promises they never intended to keep. Dipper slash Telegram editor Dipper Brian Jones is a good example. If more evidence is needed to prove Liberals are slippery creatures, ponder the election promises that were made mere months ago and the utter lack of principle in crassly breaking those promises without remorse or embarrassment. The Tories were no kinder, accusing the Liberals of knowing that the financial arse was out of her and yet making promises anyway. The federal government would run a deficit this year three times larger next year than the one the Liberals expected during the election campaign. The deficit this year is running slightly north of $18 billion and while the Liberals expected to run deficits of around $10 billion each year, the current projection puts the deficit at something around $30 billion. The economy, it seems, is in significantly worse shape than it was last November. That's the same thing that Premier Dwight Ball is saying but we should note one very importance difference. Newfoundland and Labrador was already in a bad financial spot last spring. By the time Ball took office in the fall things were twice as bad as they had been when he'd promised to get rid of the teensy sales tax hike. So while the federal situation may now find itself well up the proverbial river of excrement, they are still looking at our backside as we blaze a trail to the headwaters. Years ago, a couple of enterprising reporters at CBC submitted what was then a request under the Freedom of Information Act for information about entertainment expense allowances for senior bureaucrats and cabinet ministers. They got the information and aired a story that claimed that, in a time of great restraint, the government had increased the budget for entertainment. It was a wonderful story that made the government look bad and that raised all sorts of self-righteous indignation about fat-cat politicians and bureaucrats living it up while the poor folks suffered. The infamous JM is at it again. "Top 10 Muskrat Myths" (via Uncle Gnarley) rebuts 10 of the arguments in favour of Muskrat Falls. All of this has been argued before in several places, but this is a one-stop summary of the key points. “It will generate Export Revenue”: Initial export sales of 2,000 GWhr (40% of MF output) will generate about $80 million annual revenue, based upon current market pricing. To put that figure into perspective, interest on the ~$8 billion (the final figure may be much higher) which will have to be borrowed for this project will cost about $320 million a year. Muskrat Falls will not be a significant revenue generator for the province until it is paid off in 2067. In the second part of his myth-busting extravaganza, JM tackles the claim that Muskrat Falls will stabilise electricity rates. This is a long, dense post with lots of charts. it will turn most people off. The big take-away is that, as SRBP and others have told you, Muskrat Falls is going to double electricity rates, guaranteed. Double the rates, at least. But the bigger point is that doubling rates will push electricity consumption down, despite the fact that Nalcor sold Muskrat Falls on the assumption that consumption would only go up. The problem is that we pay for Muskrat Falls whether the energy is needed or not. "The impact on ratepayers will be profound," JM notes. If we have to distribute the cost over fewer kilowatt hours, you can expect the price for each kilowatt hour will go up. That will induce even more conservation with a similar pressure on prices. JM notes that Nalcor hasn't produced a simple set of rate projections. The reasons is likely that Nalcor doesn't know how it will translate the final cost of Nalcor to rate payers. For example, a future government may find itself under pressure to keep electricity prices down. One way to do that would be to limit how much of the total cost of Muskrat Falls is recovered through rates. Here's how that might look. If MF costs $10 billion all-up, half of that is covered by the federal loan guarantee while the other half is provided by the government through additional borrowing. The provincial government might decide to only recover the half of the cost covered by the federal loan guarantee. The government itself would pay back the other half through other taxes. Since taxpayers and ratepayers are the same people, the final cost will be the same. The difference is that government can hide half the cost of Muskrat Falls with a bit of creative accounting. There are reasons why the House of Assembly destroyed the province's transparent electricity rate system in 2012 and replaced with one ultimately dictated by cabinet. Hiding the real cost of Muskrat Falls from consumers is one of them. James McLeod had a tidy piece in Wednesday’s Telegram on the government’s effort to find a way of out of the financial mess. it's well worth your time. The document McLeod got through an access to information request shows the extent to which the cabinet wants to cover all the bases in finding a way out of the province’s current mess. The document, which we already knew about, tells government officials to look not only at what they are currently doing but also how they are doing it. What comes back to cabinet for discussion should be as wide a range of options as possible. It’s precisely how the government should be tackling the problem it faces, despite what the Premier’s out-to-lunch messaging has suggested. "Indecision becomes decision with time" someone once said. The current fiscal nightmare in Newfoundland and Labrador is real. One only need compare the amount of borrowing in 1933 (34%} to the borrowing today (30%) as a share of spending. The similarity is stark and raw and scary. Sadness and desperation come to mind as the ghosts of history now stare down the new Ball government. They certainly didn't make this mess but they are now summoned to clean it up. If the issue wasn't so serious, it would be funny. Newfoundland and Labrador is up the financial creek, according to Charles Lammam, an analyst with the Fraser Institute, in a new opinion piece with a couple of his colleagues.. The cause is excessive government spending. "Had the government restricted program spending increases since 2004/05 to the combined rate of inflation and population growth, Newfoundland & Labrador would now have a small surplus, not a large deficit." You certainly won't get any argument from this corner about those observations. The problem is that over the last decade, Lammam and the rest of the folks at the Fraser Institute have consistently told us that Danny Williams and Kathy Dunderdale were the finest financial managers in the country among the provincial premiers. That's significant because they are the premiers during the period when Lammam now says the government was spending way too much. The two ideas don't fit together. It's not as though we suddenly learned things we didn't know at any point over the past decade. Some of us have been criticising the excessive increase in spending by the provincial Conservatives since 2006. By the time we got to 2009, Williams had admitted government spending was unsustainable. Dunderdale admitted the same thing every year she was in office. It's not like the folks at the Fraser Institute could have missed the repeated admissions of fiscal mismanagement. Which Fraser Insitute conclusion should be accept? The Fraser Institute has produced such laughable "analysis" of Newfoundland and Labrador over such a long period of time that we can only conclude their most recent observations are a fluke. What we should do is be extremely wary of pronouncements from folks like Fraser who can look at the same data and come to diametrically opposed conclusions. There's a fairly obvious problem with the way they do their analysis. And anyone pretends to be a psychic forecaster who says "never saw that coming" is someone we should just laugh at. Premier Dwight Ball has changed his position. “We’ve met with some of the labour organizations and leaders right now, so what we’ve committed to — and it hasn’t changed — is attrition still remains as the primary source for us to see changes in numbers around the public sector, and a fair negotiating process,” Ball said. Ball said job cuts in the government will be tied together with contract negotiations. “They’re all connected, because it’s all where you save money and expenses,” he said. The problem at St. John's city council isn't the recent budget. Council is a nest of ego and ambition. Not so very long ago, council members fought among themselves privately and publicly. Some of it wasn't very pretty. Some of it was often very petty. But in the clash among councillors the public found out about what was happening with their city. The current crop of councillors decided that the best thing for them to do is take decisions and debate out of the public view and to move it behind closed doors, into the shadows. They caught the disease of arrogance and entitlement that infects provincial politics. The budget was nothing more than a symptom of the deeper problems at city hall. Telegram editor Peter Jackson took a hard look this week at the implications of Nalcor’s effort this week to jack up electricity rates. As part of the company’s rate application to the public utilities board, Nalcor said a relatively dry season on the island had deleted its water reservoirs. As a result it had to burn more oil to make electricity and therefore ratepayers needed to cover that cost. Jackson notes that with Nalcor’s plan to scrap the Holyrood generating station, we’ll be left to rely on Muskrat Falls and its relatively small reservoir. That small reservoir means the Muskrat Falls generators will depend on a water management arrangement with Churchill Falls. Finance minister Tom Marshall went around the province during that year’s budget consultation – now “rebranded” as “engagement” – with this big electric counter that purported to show how much interest on taxpayers were racking up on the public debt. $1,400 a minute back then. “That clock is ticking away showing a tremendous amount of money on interest that I'd rather see go into programs," said Marshall, in a CBC story about the annual budget circus. Now here’s the real question: what year was that? It’s right there, right after “affordable and sustainable public services” as one of five principles listed in the colourful little hand-out the government has been using as part of its “engagement” exercise. How odd then that so far the Liberal administration has failed to apply the principle of supporting decisions with evidence. Politicians are usually very careful about the words they use. That’s why it’s important to notice the words Premier Dwight Ball used this weekend in an interview with Tom Clark for Global’s current affairs show The West Block. Ball said there was “no real sure fix” for the provincial government’s financial problems. But he did say that the government’s plan would involve revenue-generation, controlling expenses, efficient spending, and “what Ottawa can do to help initiatives around infrastructure.” Ball also said that the provincial government would be applying for the same “sustainability” funding that Alberta was getting. So what does that mean in concrete terms? "I'm concerned that we have an aging asset,” natural resources minister Siobhan Coady told CBC in explaining the most recent break downs at the Holyrood generating station. About two years ago, in the midst of darknl, then-Premier Kathy Dunderdale said pretty much the same thing: “We've talked incessantly, it seems to me, over the last number of years about the aging facility in Holyrood and the fact that that facility needed to be replaced.” Before that, Nalcor and its supporters used “aging infrastructure” and the inevitable climb of oil prices as the excuse to build the multi-billion dollar Muskrat Falls project. The old whine in new skins isn't any sweeter in the ear whether it is coming from Coady or Dunderdale. Indeed, what’s most disturbing about Siobhan Coady's media interview is that in the two years since darknl we have learned that the lines someone fed Coady are not true. Yet someone still fed Coady the false lines and Coady used them. Two former Premiers sent a very pointed message to Premier Dwight Ball this week about the way Ball has been handling the provincial government’s massive deficit problem. Brian Tobin was in St. John’s to present a cheque on behalf of the Bank of Montreal to the celebration of the 100th anniversary of the Great War. Tobin said people need to understood that the current cabinet felt a problem far worse than any other in the province’s history. people need to pull together, but for Ball personally, Tobin said that while it was best to be consistent and right, if you had to pick between the two, it was better to be right. “Do the right thing,” said Tobin. Grimes did media interviews on Wednesday in addition to offering a guest post at SRBP. He told Ball that it was important to put everything on the table. Grimes specifically cited Muskrat Falls, with the billions in borrowing to finish the project, as well as energy marketing and offshore oil equity stakes. On the one hand, it’s great to live in a country that has a program to let the federal government shunt money to provincial governments that run into financial difficulties. On the other hand, it’s disappointing that the current provincial administration is talking up the prospect of getting more hand-outs from Ottawa rather than bringing its spending in line with its revenues. Unless the federal government changes the maximum payable, we are talking about a mere $31 or $32 million for Newfoundland and Labrador. The legal authority for the Fiscal Stabilization Program is in the Federal-Provincial Fiscal Arrangements Act. The amount of money a province can receive comes from a formula in the Act that compares one year’s provincial revenue with that of the year before. The formula distinguishes between resource revenue and non-resource revenue. The Act sets a limit on the maximum amount available to a provincial government. The limit is $60 per person in the province according to the most recent sentence. If the formula gives a larger amount than the $60 per capita, a provincial government can receive the full amount. Anything beyond the $60 per person maximum would be considered a loan. From a decade of prosperity to $2 billion deficits: What happened? Reflecting upon becoming the eighth Premier of Newfoundland and Labrador 15 years ago this month, I found myself chatting with a few friends and associates about where the province found itself fiscally at that time, what happened during the next decade, and where we find ourselves today. During my tenure as Premier, we were a persistent “have not” province with a deficit problem of roughly ten percent. We ran annual deficits of roughly $500 million on a total budget of $4.5 billion. Now, after a decade of unparalleled prosperity and “have” status within the Equalization system, we find ourselves with a twenty-five percent deficit problem comprised of a $2 billion deficit on an $8 billion total annual budget. These days campaigns are about collecting information on voters and using the data. 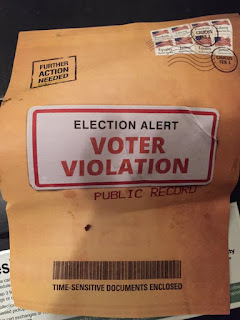 The Ted Cruz campaign has been especially aggressive in Iowa with a mailer that highlights the poor record of some voters of participating in caucuses. 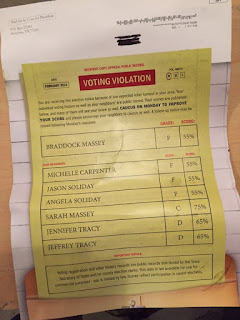 The thing came in a brown envelope (above) and consisted of single sheet of yellow paper (below) marked like a ballot that showed a score and percentage grade for voters named on the sheet. 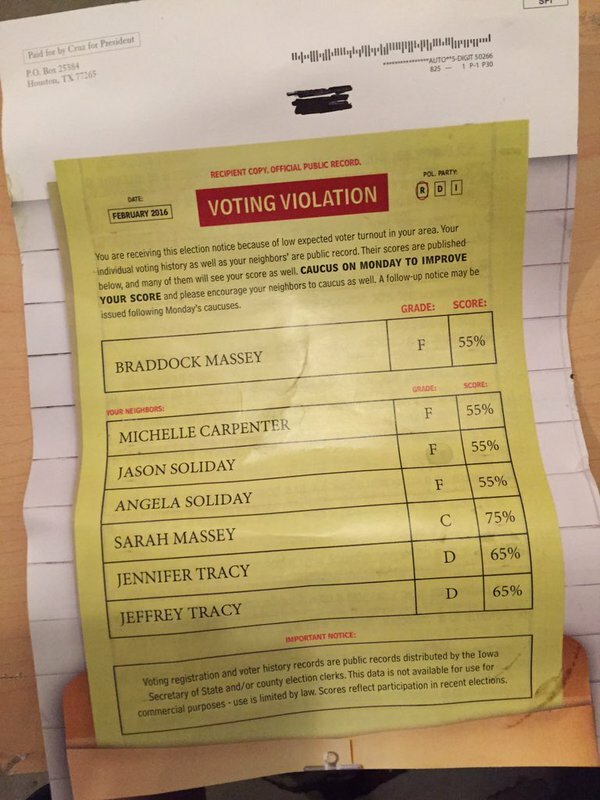 These folks don’t typically turn out to vote, so Cruz was trying to goad them into participating. Voting records are public in some American states so campaigns can tell who voted and who didn't. Your neighbours. You can tell if it worked by the results from Monday’s caucuses. Before Newfoundlanders stopped governing themselves in the early winter of 1934, they’d run a sometimes arduous course. Newfoundland gained a limited form of self-government in 1832 and in 1855 gained Responsible Government. That gave control of virtually everything except defence and foreign policy to a cabinet made up of members of the elected assembly and the appointed upper chamber of the legislature. By the 1880s, the government wanted to expand the economy beyond the fishery. They started a railway project to open up the interior of the island and the western coast, much the same way that the Americans and Canadians had used the latest technology – the railway – to expand to their west.